With winter suddenly hitting us hard with below-freezing temperatures some days it’s kind of the perfect time to hunker down—and we suggest choosing Dream Midtown so you have easy access to this cozy 20-pound spiked hot chocolate. 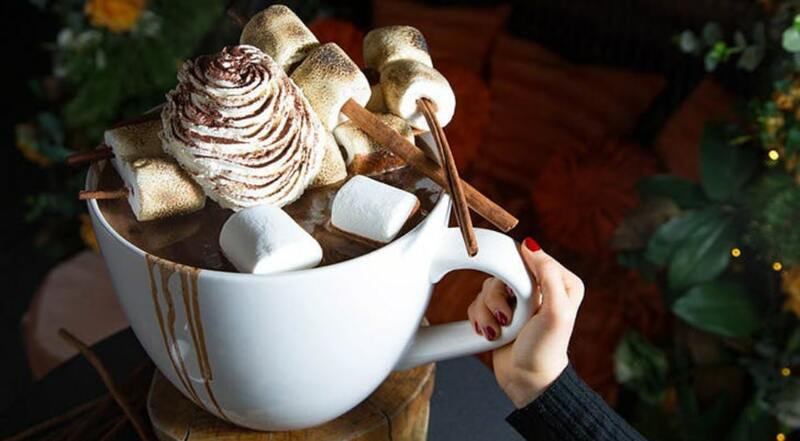 The oversized mug of chocolate is made with Valrhona extra bitter 61 percent chocolate, Jivara chocolate, and is complete with equally as oversized charred marshmallows and cinnamon sticks in addition to housemade whipped cream and spicy cocoa powder. And how could we forget the booze? When you order the item you’ll also be able to add your choice of tequila, whiskey, or cognac. The boozy mammoth of a hot chocolate will be served from January 31 (National Hot Chocolate Day), until February 14…because everyone knows Valentine’s Day is synonymous with consuming large amounts of chocolate. Bonus: Valrhona chocolate specifically is hosting a Hot Chocolate Festival across NYC from January 19 through February 3! During this time, you can visit a handful of bakeries, restaurants, and chocolatiers around the city (mapped out here) and try their unique premium hot chocolates. For each cup you get 50-cents will go to support the Food Tank Organization in NYC.